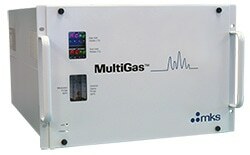 The MultiGas™ 2030 is an FTIR Spectroscopy gas analyzer capable of percent level detection as well as ppb sensitivity for multiple gas species in a variety of applications. Integrated gas cell pressure and temperature monitoring. Automobile, diesel, locomotive, and catalyst exhaust monitoring.